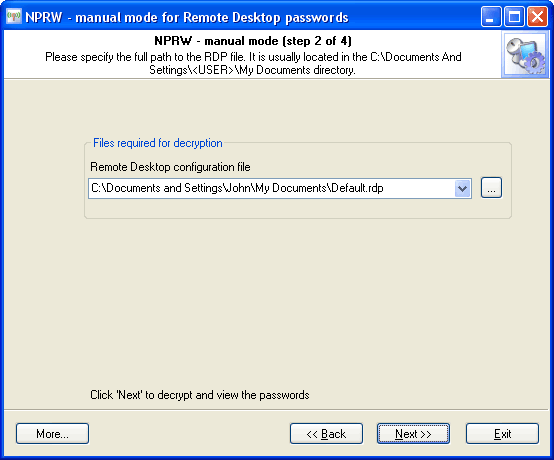 Remote Desktop Connections passwords are stored in *.rdp files, which are normally located in the current user's My Documents folder. When you select the manual mode, NPRW will automatically scan your disk searching for these files. 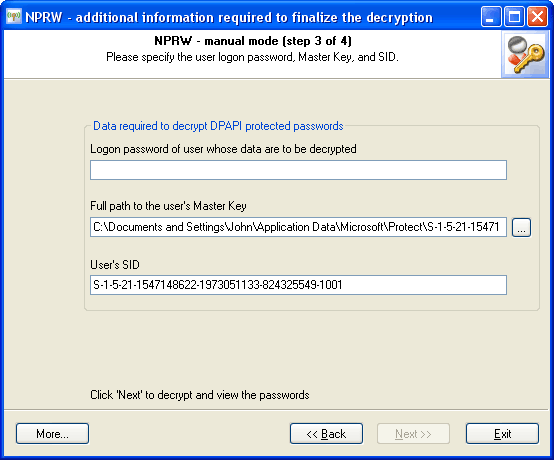 If the program was unable to find a *.rdp file automatically, you can try locating it manually and entering the path to it by hand. Please note that RDP files have hidden attribute, thus may be invisible from Windows Explorer, Windows Search, or from 'Open As' dialog. Start -> All Programs -> Accessories -> Communications -> Remote Desktop Connections. Usually, if you deal with a local account, the last two parameters will be filled by the program automatically.